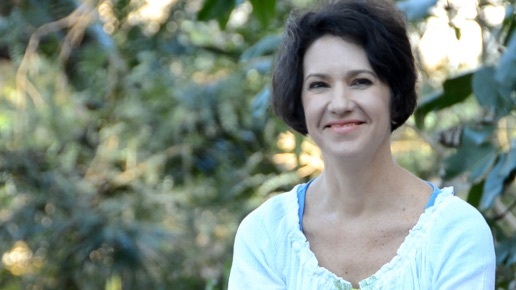 It is with great pleasure to welcome June Perkins to share about her gorgeous and intriguing new anthology of poems representing the magic of a little piece of tropical paradise. 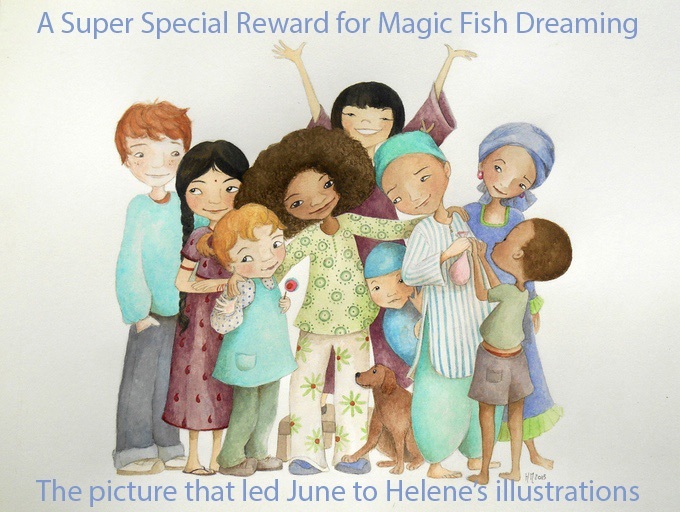 Together, June and illustrator Helene Magisson have worked wonders in creating the delightful Magic Fish Dreaming, and turning this ‘dream’ into reality. 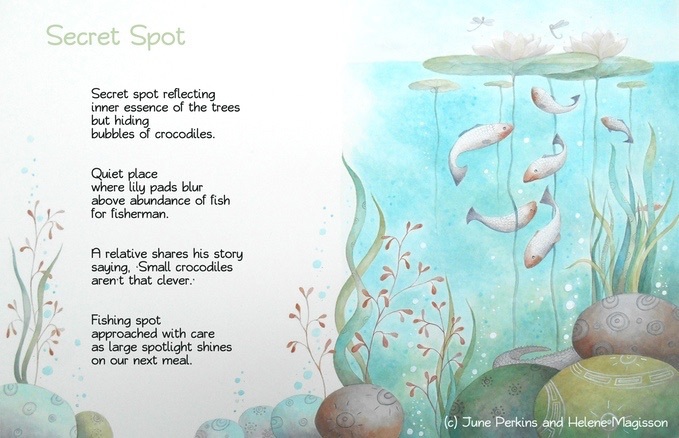 Magic Fish Dreaming is a collection of poems all set in Far North Queensland particularly for 6-10 year olds, but some of the poems are more challenging so children can grow up with the book. It focuses on the animal, plants, family, environment, and the magic of imagination and story. I don’t want to reveal too much, but the samples we have online in audio, written and visually illustrated form include a poem about: secret fishing spots, fishing with your noisy family and visiting a river, where there is a strong sense of the sacred. On twitter I hinted that there is a poem about chatting with a cassowary and there is a sense of the imagination and sacred in the book as well. It is not necessarily a book you read cover to cover, but more in the style of an anthology (it is 36 pages to be closer to the length of a picture book), so you might read one or two poems at a time and talk about them or where relevant act them out, although I am sure children will turn through to see the pictures all in one sitting, as they are going to be so enchanting. I wrote nearly all of the poems when my children were around six to twelve, and I was doing community arts projects and sometimes teacher aide work with poetry and literacy in schools. Many of them have been performed and even previously published as well, but never together or with illustrations. Magic Fish Dreaming is striving to introduce children to the sometimes strange and beautiful landscape, creatures, and people of Far North Queensland as well as a variety of poetic techniques, not just rhyme, but rhythm, personification, narrative and lyrical. I particularly like poems with a strong and musical beat, story, or which experiment with who is the speaker and who the narrator of a poem is speaking to. Another aspect is that the illustrations themselves are kind of visual poems. Helene Magisson has added in visual aids that will assist the children to grasp the poetry even more easily. This collaboration is really exciting as I see the ‘Hunting for Poem’ become a real hunt for letters flying through the air and I am sure she is going to come up with some cool ways to help children understand the deliberately trickier poems and enhance the delivery even of the simpler poems. We went with a kickstarter campaign, because this was not the kind of book we thought a big publisher would take on, as it is so niche, place based, and focused on poetry as well as being a picture book format. I also knew it would need a very particular kind of illustrator and wanted creative control of choosing that illustrator which you don’t get most of the time when you go to a publisher (particularly as a new picture book text author). I think we just knew the collaboration would work after I commissioned her to do two poems and the cover for the kickstarter campaign. It helped too that Helene just loved the poetry and could see its value in a publication for families and children. There is a lot of trust when you give your writing to an illustrator, and I just knew that I could trust Helene after seeing her creations. I am always intrigued by what Helene comes up with and the only guidance I really give her is on the environment and people in Far North Queensland, and more technical stuff if she needs it. She does her own research as well, but I am happy to provide photographs and other information when she needs it so we represent the place really well. It has taken me nine months to prepare for the kickstarter, which I did after an online course with the Children’s Book Academy. Jed Alexander one of our tutors in the course has been mentoring me with my campaign during that time and ensured that I did the best I possibly could with preparing the campaign and creating my page, through his own experience of running a campaign. The most exciting things about the campaign have been that as well as having backers from Australia we have attracted them from the United States, France, Philippines, New Zealand, UK, Papua New Guinea, Chile, Israel,and Canada. The most challenging thing about running the kickstarter has been doing our own publicity and making it interesting for all those following us, so they get as excited about the project as us, and don’t feel annoyed. All our friend, family, and writing networks have been absolutely brilliant at helping us out with that, and are solidly behind us and believe in our product. Many of Helene’s French speaking friends and family have backed the book even though they will be reading it in their second language. I think if you have a passion for something people can see that, and hopefully don’t get too annoyed, especially if you are imaginative, and fun with your updates. For Helene it was her first time in a video interview, for the kickstarter video, I thought she did really well even though she felt nervous at first. We were so happy to reach our first goal for kickstarter and get our project green light on the weekend, but would love to have more people, and places to send our book so it is in the homes of people around the world. Now all backers in our last week know the project is definitely happening. Check out our extension goals of how we would spend additional funds, and also pledge if you would just love to have a copy of this to share, read or gift. Sounds, and looks, absolutely stunning! Thanks so much for sharing your wonderful project with us, June! Visit and pledge for Magic Fish Dreaming at the Kickstarter Campaign here. June has been writing, publishing and performing poetry since she was six. 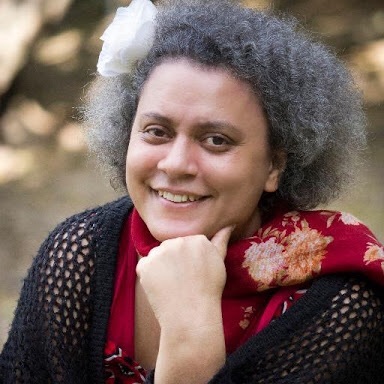 She has created two books previously, Under One Sky, the first anthology of the Licuala Writers, and After Yasi, finding the Smile within, a photo story book for community about the recovery from Cyclone Yasi. 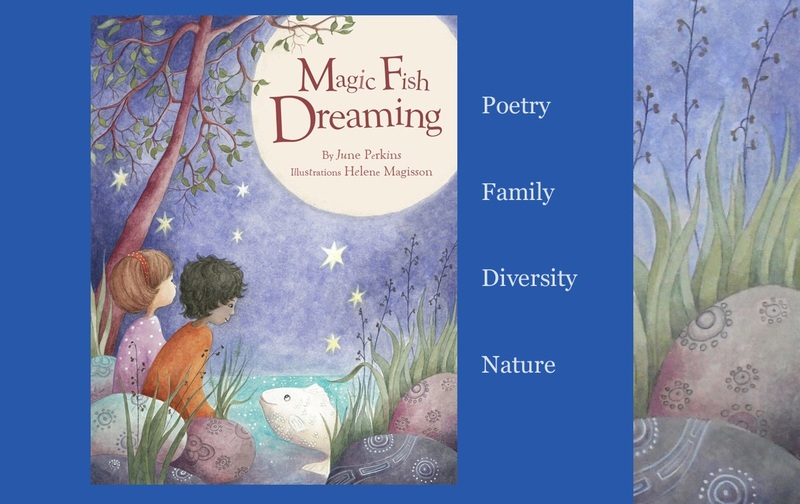 Visit June at her website, Facebook and Twitter pages, and Magic Fish Dreaming at its own Facebook page. Helene Magisson, is an award winning illustrator, who has other picture books soon to be released such as The Night Before Christmas, as well as The Velveteen Rabbit, already out. Both will be with New Frontier. She now has an agent and is sure to have many more picture books out soon. Visit her website and Facebook pages. Thanks so much for including the project on your blog. We are so excited to be producing this book. Aw, that is so lovely. Am so uplifted by our backers’ support and enthusiasm for Magic Fish Dreaming.